There’s something decisively optimistic about striding out on a chilly day, camera wrapped in a bread wrapper to protect it, getting way down at ground level, and focussing on dirty thawing snow at the side of the road. A reminder that in half the world it’s nearing the spring equinox, but nature and the four seasons don’t pay much heed to that. 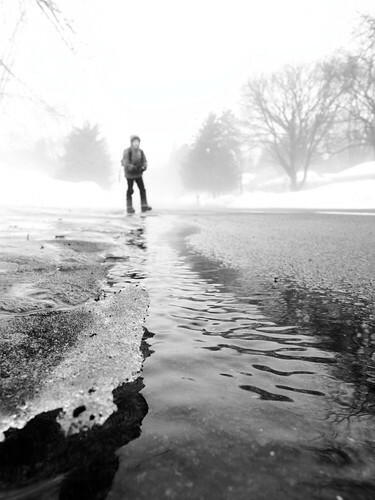 And there’s a beauty in melting dirty snow, and roadsides, and the kind of murky day where the damp gets into your bones no matter how many layers you put on. And despite the bone-seeping cold there’s an urge to get down low to document someone else putting their best foot forward with a spring in their step.